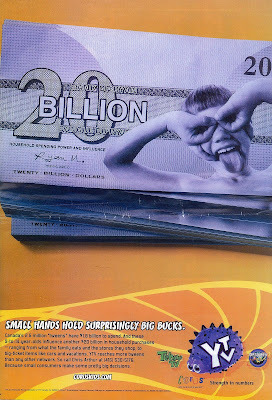 "Small Hands Hold Surprisingly Big Bucks!" and it's an ad encouraging you to spend your advertising dollars on YTV. The ad itself likely comes from the folks at Pester Productions, the in-house kidvertising agency representing YTV, Treehouse and Discovery Kids. In fact if you slide over to their respective websites you'll learn a bunch of stuff. 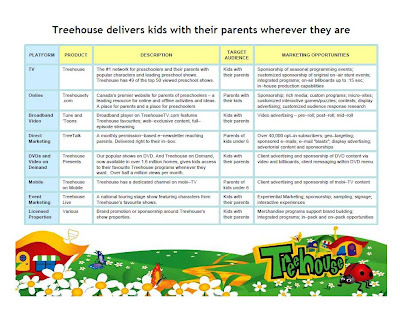 Treehouse, in their report entitled, "Targeting Moms", thinks that a mom plus a tiny kid equals a, "4-eyed, 4-legged super-consumer"
They also proudly report that they, "deliver kids with their parents wherever they are". "96% of parents say they "always" or "sometimes" ask their tween's opinion when deciding on a Fast Food restaurant." 87% of parents say they "always" or "sometimes" ask their tween's opinion when purchasing groceries for the household. Almost 3 in 10 parents say they "always" or "sometimes" ask their tween's opinion when deciding on which car to buy for the family. 20% of parents say they "always" or "sometimes" ask their tween's opinion when deciding which hotel to stay at for the family vacation." "The long term prize: Loyalty of the kid translates into a brand loyal adult customer"
They then break down where tweens get their $2.9 billion in direct spending (crunching the numbers from their allowances, extra money, birthday money, Holiday money, work money and back to school money") but of course emphasize the more than $20 billion kids control through what they call, "Nag Power", "Pester Power", or "Kidfluence". "A 'must-buy' for advertisers trying to reach kids and their parents." "Discovery Kids not only effectively reaches children six to 12, it allows you to associate your brand with 'parent-approved' television." These sites and messages sure don't give me the warm fuzzies! How about you? Stay tuned tomorrow to find out the type of products being marketed by YTV and find out how even as far back as 1847 people recognized that advertising to children is simply unethical (I guess YTV didn't get the memo).